All arrangements were completed for five members and three spouses and the group of eight left Karachi by Sri Lankan Air Line on October 15, 2015. We reached Colombo Airport in time and after all the immigration formalities were attended, we came out and met the representative of IESL who was waiting for us to take us to the hotel. We started from the airport to the hotel on a newly built highway and the journey to the hotel was of an hour. We were all booked in OZO Hotel and all the IEP Members were presented with a nice hand bag having all the program details for three days. At the hotel, we met the Indian and Nepali Delegates who also reached there at the same time. The senior member of Nepali group missed the flight and could not come along with the other delegates. IESL booked three vehicles, one each for Pakistan, India, and Nepal Delegation. 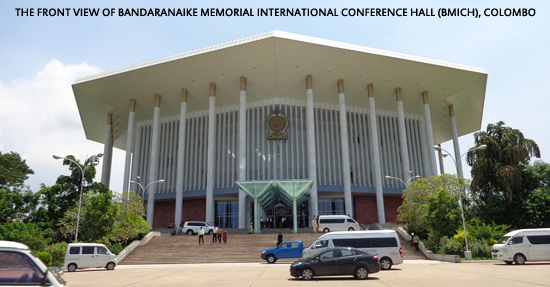 The next morning, we all attended the Inaugural Session of the 109th Annual Sessions at the Bandaranaike Memorial International Conference Hall (BMICH). At the BMICH arrival, we met the President of IESL Eng. (Dr.) S. B. Wijekoon and rest of the Council members of IESL. The Chief Guest, Eng. Patali Champika Ranawaka; MP and Minister of Megapolis and Western Development arrived in time and was received at the entrance in their traditional way. The folk dancers with their local drums and band were in front and guided the chief guests into the BMICH main hall. As a tradition, the chief guest and all the senior members have to light the candles on the Ceremonial Oil Lamp. First Chief Guest lightened the candle and later all the other members and foreign delegates representative lightened the candles. The inauguration started with the National Anthem of Sri Lanka. The President and the President Elect of IESL addressed the audience. First the keynote speaker presentation was completed and after that the Chief Guest, an engineer, addressed the audience. The Chief Guest announced that a bill is to be presented in the Parliament for the forming a Regulatory Body for the Engineers. It is like the Engineering Council (PEC) in Pakistan. Finally, certificates were presented to all the eligible council members by the Chief Guest. After the inaugural session, the audiences were entertained by very delicious snacks. The President of IESL was very thankful to all the foreign delegates for attending the inaugural session. We were very impressed by the BMICH main hall and all other facilities available in the hall. We had our lunch at the hotel and performed our Friday prayers in a local mosque. In the evening, all the foreign delegates went to the IESL Head Quarter and had a meeting with the President IESL and few Senior Council Members. Engr. Suhail Bashir briefed IESL President about the Regulatory Body of Pakistan (PEC). The President stated that we would like to get assistance from Engr. Suhail Bashir while drafting the rules for the Regulatory Body for Sri Lanka. Delegates from India and Nepal also stated the rules applicable in their countries as well. After the meeting, we had very delicious dinner with some good local dishes. We noticed that most of the dishes are of rice and we realized that Sri Lankan uses lots of chilies. After dinner, there was a music program and all the musicians were IESL Member. The next day we attended the Seminar on Sustainable Infrastructure Construction in Developing Countries at the Mihilaka Medura Hall in the BMICH. The seminar was chaired by the IESL President. Good papers were presented including one by Engr. Suhail Bashir of IEP. His paper was entitled Key Challenges to Sustainable Infrastructure Construction in Developing Countries. The shields were presented to all the participants of the seminar. We had our lunch at the hall and later we left for our hotel. After an hour rest, we went for sightseeing of Colombo City. The first half of the day the weather is bit hot but in the later half, it rains and the weather became pleasant. We visited few gift shops and noticed that the goods are expensive and not as good as we can have them in Karachi. We saw a few very prominent buildings of the city like the Parliament House Building, Air Force Head Quarter and few more. The good thing which we all liked was that all the streets were very clean and we could not see any rubbish on the roads. In the evening, we were invited to dinner by President IESL at Ivy-Cinnamon Grand Hotel Colombo. We reached the hotel in time and met all of our new friends and members of the IESL council. Hot drinks and soft drinks were served along with snacks and after an hour the IESL president made a speech in which he thank all the foreign delegates and later he presented nice shields to all the foreign delegates. Once the host finished, the Pakistani and Indian delegates presented souvenirs from their countries to IESL prominent members and the delegates of each other's countries. The Nepal delegates could not present as their Senior Member had all the gifts and unfortunately missed the flight; all the gifts were left with him. After the presentation, the dance performances by local girls were presented and everyone enjoyed it. In the meantime, the dinner was served and after the dinner the people started dancing on the floor. The function ended and we left early as we were preparing to go the Construction Dam Site which was a three-hour drive from Colombo and the group will be leaving very early in the morning. The next morning we left very early without breakfast as we were told that the breakfast will be served in the middle of the journey. There were two buses full of IESL Members with their families and we were in our Coater Van dedicated for Pakistani Delegates. The Indian and Nepali delegates did not join the group to visit the dam site. We all reached the venue for breakfast which was along a very pleasant lake side. The breakfast serve was full of local items and fresh fruits. We enjoyed all the items, most of the dishes were rice based. After breakfast, we were on our route to the Moragahakanda Reservoir Headwork’s Project. Once we reached the head office of the project, we were received by the Project Director. A detailed technical presentation was given by the Project Director. After the presentation, we all went to the construction site. What was explained at the head office was all shown and further explained at the dam site. The time came when our trip with IESL came to an end. We all thanked the IESL President Elect for Session 2015/2016, Engr. Wimalasena Gamage, for the hospitality shown by all the IESL Officials and Council Members and other staff. The next morning we left the hotel and for the next full week we all were on our own visiting different cities of Sri Lanka.